"I don't want to seem too political," a young, single woman said the other day when asked why she didn't vote. That's not a punch line; In the last presidential election the largest bloc of non-voters was unmarried women -- over 20 million of them. Imagine what could happen if those 20 million people make their votes count, and their voices heard, on November 7. Women's Voices, Women's Vote, along with filmmaker Julie Bergman, did more than imagine. As part of their campaign to find a solution to this critical issue, they have made one of the most effective public service announcements to "get out the vote" I have ever seen. 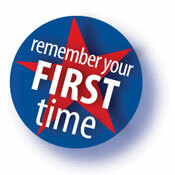 The campaign is called "Remember Your First Time," and it features the amazing and talented actresses, Tyne Daly, Rosario Dawson, Lauren Graham, Angie Harmon, Marg Helgenberger, Felicity Huffman and Regina King talking about, well, their "first time." Voting, that is. These beautiful, smart actresses deliver lines like this one, perfectly put by Felicity Huffman: "I like to do it in the morning when I'm fresh." Or Angie Harmon saying, "I did a lot of research on positions I like." And Regina King admitting, "I was the last one of all my friends to do it." These PSAs are so inspiring, and one line in particular really got me: "We don't have to dream about the future. We can wake up and vote for it." Click here to view the Public Service Announcements. You can put these PSAs on your blog, send them to your friends, call your local TV stations and request they air them. Visit www.wvwv.org for blog buttons and banners, links for state-by-state voter registration and other cool functionality, like a "tell a friend to vote" tool. Whatever else you do, remember: Vote on November 7.
Cooper is the parent of two girls and two boys, ages eight to one. She lives in Pittsburgh, Pa., with her husband and children. As moms, we need to make some noise about something very important. At the BlogHer '06 conference in July, I saw the documentary film, The Motherhood Manifesto (from the co-founders of www.MomsRising.org,). I learned that in Pennsylvania, where I live, it is legal to ask someone in a job interview if they are married or have children. As you can guess, this discrimination (yes, discrimination!) hurts mostly moms and single moms. Are you mad yet? Since BlogHer, I have been working with Joan Blades (co-founder of MoveOn.org) and others at MomsRising.org, as well as women in Pennsylvania to help get legislation passed that would make this practice illegal. It has been stalled in the state house and senate - for six years. I wrote an article about this, titled Maternal Profiling, and it ran yesterday in the Pittsburgh Post-Gazette. Please read it if you get a chance. If Pennsylvania can make a difference here, it would mean so much to moms and families everywhere, and could create momentum for many critical issues involving moms and families, not just on this type of discrimination. Pennsylvania could start a chain reaction, and, like I said, we need to drum up some noise. Momsrising.org has create a web page for this issue, and I have been blogging over there too: www.momsrising.org/pa. Visit the site for more information, links to PA legislators' phone and emails, and a petition. You don't have to be from PA to send a message that this is important. It is especially important to get signatures on the petition, fast. So many times I talk about this people say, "I had no idea!" and that seems to be the biggest problem, the lawmakers think since no one is talking, nobody cares. From what I know about the DotMoms, we can change that pretty quick. Guilt about raising my voice one too many times; guilt about not listening to my kids fully when they talk to me in the kitchen, non-stop, while I am doing 50 million things; guilt about chicken nuggets and Frosties. Then there is the guilt about not visiting my ailing grandfather enough; or not fully engaging in all I have to do for work; or not volunteering more at school. We don't really go to church that often, if at all. Guilt. Weeds are all over the yard. Guilt. Boxes from our move in February are still sitting there, staring at me. Guilt. My dog has started pooping and peeing all over the house and the vet says he is having emotional problems. (Oh good Lord.) Guilt. Don't get me started on my poor, forgotten husband. Triple guilt. A mother's life has a lot of guilt, doesn't it? One of my old college professors once called guilt a "wasted emotion." I wish I understood what that means. Why do I want to write more? Because blogging is a lifeline. It is an outlet I cherish and need, and the DotMoms community is one of the finest groups of moms on earth. Funny how, with moms, often it is the things that are best for us (exercise, eating right, creative outlets, time alone...) seem to always get sidelined first. How do let go of guilt and make sure to keep doing things for yourself when the world around you is chaotic? A month ago we closed on our house, moved out, and since we had recently discovered some "unforseen," yet critical, issues in our new house that had to be immediately addressed, we didn't get to move in -- the carpenters did. My husband, the four kids, the dog Otis and I were homeless. We had known for about a week or two prior to having to vacate our old house that the chances of us moving into our new house immediately were slim to none. With the holidays looming and school vacation around the corner, you can imagine my state of mind. Let's just say it wasn't pretty. My mother and father insisted we stay with them. "Oh, geez, Mom, you don't want us, believe me," I repeated over and over. I called an apartment complex nearby to see if we could rent a unit for a month or two and made the unfortunate mistake of telling the rental manager that there were six of us and a dog. We were flat out rejected. "Mom, I am sorry to do this to you, but I think we need to move in for a few weeks," I found myself saying a couple of days before the closing. It was a bit surreal to even repeat it out loud: "I (and my enormous family) are moving in with my parents." But, I will admit, I was more worried about how they were going to take it. Their house is calm, neat and very, very clean. We are not any of those things. In fact we represent pretty much the opposite of my parents' lifestyle. "Oh, it will be fun! It will be Camp Christmas!" my mother beamed. Most of Mom's friends thought she had a screw loose to agree to take us in, let alone encourage it. "This is what it is all about," she told them. Wouldn't you know, despite the fact we killed their washer and dryer (the tiny things couldn't keep up with all the action), the dog's barking, the spilled juice, the endless runs to the grocery store and the insane amount of wrapping paper and boxes that came out of that house on December 26th, it was Camp Christmas. It was more than that, too. My 6-year-old daughter got to hold hands with her grandma every night before bed and listen as my mom told her what it was like when she was a little girl. My 1-year-old walked around the house calling "Mommmmmmy," his new name for my mother, which, as you can imagine, pleased her to no end. My dad and my 8-year-old daughter built a robot on his workbench and spent three hours one Sunday afternoon teaching each other how to snowboard down the hill in the backyard. My 4-year-old son slept for the first time in a room by himself and in a "big" bed, not a toddler bed, which he tells just about everyone he meets and, when he was good, my mom played "Avatar" with him on the computer. As for me, I looked forward every morning to sharing a cup of coffee with my mom and to having dinner with my parents in the evening. On Christmas night, after the kids were asleep and the extended family was gone, my mom, my dad, my husband and I opened a bottle of wine and giggled for an hour or two. Grandparents, on a daily basis, add memories to childhood. I think my husband would agree, my parents are our best friends. And: You can go home again. At least for a couple of weeks. Last week we moved from the house we lived in for seven years. I carried three of my four children into that house as infants. My 8-year-old told me the night before we left that moving was the hardest thing she ever had to do. Thank God, but, still, I ached for her. She wrote a letter to the new owners -- "I love this room and please don't change it. If you do, I guess that is OK." -- and when we sat on the floor where her bed used to be and she read it to me, I sobbed right along with her. The whole process of moving has me sentimental and thinking about the insanely fast pace of time. Forgive the sapiness, but, this is for my kids. I called Grandma and Papa and told them I was going to have a baby. And I blinked and you were here, one by one, all four of you. I held you as you cried through the first six weeks, a tummy ache, an ear infection, a bad dream, and it seemed like forever. But, then, you slept through the night. You sat up, crawled, scooted, wobbled, walked and ran. Now it is hard to catch you. I blinked and we went off to baby classes and preschool and then you got on the school bus and were away all day. Now you dress yourself, do homework and you don't want me to hug you in front of your friends. You like loud music and you lock your diary after you write in it. Soon I will blink and you will want money for jeans and keys to the car. You will want to make your own decisions and won't like some of the things I have to say. You might not think I understand. But I promise I will try. I will blink again and you will be off to college. Someone will ask your dad and me, "Who gives away this child?" Then, someday, I hope, you will call me and say I am going to be a grandma. I will cry and you will cry. Soon enough you will tell me you blinked and time flew. And I will smile and nod because I understand. Yep, you heard it here first, an innovation in sibling rivalry so supreme you will never have to utter another "Come on guys, stop it," again. It is beautiful in its simplicity. When a fight breaks out that is obviously not going to be settled before blood is drawn, send the dueling party to the bottom step of the staircase. I call it "The Love Step." "Oh no, do I have to sit next to her?" "Hey, Mooooooooom, he's getting off the Love Step. Tell him he's going to lose his Game Boy." "I am never leaving the step, I am going to stay here forever." I have a pretty steady success rate with this method, and usually there are smiles and a new attitude born from the Love Step incarceration in under six minutes. If only the Love Step worked on my biting, hair pulling, hitting 18-month-old. I gave you my trick, do any of you have one for me? We want to hear from you! Have a favorite website that you find interesting, informative or just fun? Send it to Cooper at themotherboard@verizon.net. Every Monday we will feature a new site here at The Mother Board on DotMoms. Visiting "I Used to Believe" (www.iusedtobelieve.com) -- a collection of ideas that adults thought were true when they were kids -- takes you right back to age five. "I used to believe that ham came from hamsters." "I used to believe that my thumb got smaller the more I sucked on it." "I used to believe that if you ate bananas you would grow a tail and become a little monkey." When you think about all the things you used to believe, it sure makes you wonder about the daily, mini-dramas going through your own kids' heads, doesn't it? There is something strangely addictive about perusing Bill Keaggy's collection of 800-plus Grocery Lists. Maybe it is the voyeuristic fun of reading lists that consist of items like "chicken -- big," "burrito for Steve," or "case of cheap beers." Keaggy loves to collect, and his main site -- www.keaggy.com -- features, among other things, photos of rocks shaped like shoes. So, after reading the grocery lists, check out his main site, too. Have a favorite website that you find interesting, informative or just fun? Send it to Cooper at themotherboard@verizon.net. Every Monday we will feature a new site here at The Mother Board on DotMoms. Welcome to The Mother Board, a weekly DotMom feature that will highlight a new website, suggested by you! Our first site is Mother Proof. Ever try to wade through car reviews and realize the writer has likely never had the joy of driving a car filled with kids? Mother Proof makes sure we get the inside scoop on family-friendly vehicles (and then some) according to all those unique needs of ours -- even if we pretend we don't drive a minivan.